Fractions in your head, is that even possible? Yes it is. And we will show you how in this little book. There are 42 lessons in this book. Just do one lesson per day, and you will see magic happen in just 40 days or maybe even sooner. Fractions is the first topic where the education system first fails the students in math education. Children who for some reason don’t “get” fractions, are forever left behind. School systems do not pay adequate attention to making sure that each and every student is completely proficient in Fractions. Hence your student may have moved on without a total understanding or mastery of fractions as a topic. This is not good at all, as this little misstep dooms the child to forever fall behind in math. If your student is about to enter sixth grade or is in higher grades but seems to have trouble with math, you must make sure that she/he has mastered fractions. If your student is about to take PSAT or the SAT exams and is unsure about his or her math skills, this book will help her to feel confident and be able to do tricky-looking word problems quickly in her head. Majority of the SAT problems involve fraction manipulations. Your child has probably been taught other slower methods of doing fractions in school, we will teach him faster methods of doing these types of problems. Time is of the essence for Math part of the SAT, and doing problems the long drawn out, algorithmic way, as taught in schools, just takes too long. In this book, we give you a time-proven and superior method for giving your student a head-start, an advantage that she or he will retain for the rest of his/her life. She will develop confidence in her ability to understand and do complex looking problems, such as the one given below, quickly and in her head. The distance from Paoli to Christiana is 24 miles, and (2/3) of this distance is (4/5) of the distance from Christiana to Lancaster. What is the distance to Lancaster? The book comes in two versions, the teacher version, contains the questions and the answers. This version is for you, the teacher. The student version has only the questions and no answers, and this is for your student. Both are included in this pdf version. 1. You must start this course at lesson one, even if the problems seem very simple to your child. 3. All of these problems can be done mentally. When you read the problem to the child, he or she may write down the numbers but all calculations should be done mentally. 4. Follow the method that is given at the beginning of each lesson. The solutions given should be explained to the student if she has difficulty. 5. Most students can easily do half a lesson a day. Some longer lessons can be spread over a week. The problems do appear more difficult towards the end of the book, but are not if previous lessons are completed diligently. 6. Subordinate speed to accuracy, but do not neglect speed. The ability to answer these problems quickly results in mastery of the concepts. Always pay attention to how quickly the student can answer the question. 7. The course is suitable for students in 4th-6th grades and above depending on the child’s ability with arithmetic. 8. Older students who are not confident with fractions or weak in algebra will benefit from this course as well. College entrance exams often have problems of this type on the tests. This book is an excellent refresher course for boosting math scores in standardized tests. 9. This course is also excellent for an older adult who may be suffering from cognitive decline or feels that his/her mental calculation skills have weakened. 10. 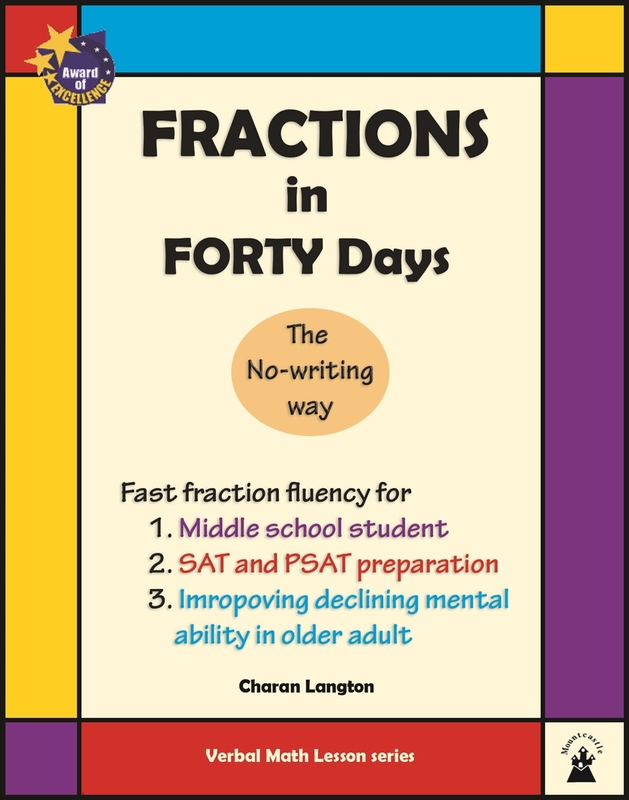 If your student has difficulty with understanding or retaining these problem by just listening to the numbers, please consider buying the Verbal Fractions Student Copy, without the answers. The student can then have his own copy but of course without the answers or the solutions. It is available both in PDF and eBook formats. For pdf version, go to our website. 11. After you have done approximately two-thirds of this book, please consider starting the companion book on Percents. 12. Last two chapters are indeed difficult for many students and are not necessary for proficiency. See sample file on this page.